I now have listened to the Playback Designs MPS-5 in a variety of systems for several months and am still not completely sure that I have taken the full measure of its not inconsiderable capabilities. The unit requires an extended break-in, say a minimum of 500 hours. While it never sounded unsatisfactory during this period, it was only toward the end that the bass was right. In addition, the Playback Designs MPS-5 is fairly sensitive to the power cable used, preferring something which has low noise and is tonally neutral like the excellent Stage III Zyklops, and is extremely sensitive to mechanical isolation. The stock feet that are provided with the unit are actually so good, that the sound was negatively impacted by my Halcyonics isolation base until I also inserted Cerabases between the bottom of the Playback Designs MPS-5 and the top of the Halcyonics. Prior to a discussion of the sound, a few words of description: This is really two products in a single box – a world-class CD/SACD transport and a DAC that can receive a variety of external digital sources, including PC-based music servers. The Playback Designs MPS-5 begins with a modified Esoteric transport mechanism which offers excellent stability and reliability. There seems little disagreement that while there are many transports available OEM, the platinum standard is clearly the Esoteric. The build quality is unsurpassed in the industry as is its reliability. I have now owned an Esoteric X01-D2 for a number of years and in all that time have had not a single glitch. It has operated flawlessly. To the extent that one can improve on the Esoteric players, it is in their digital signal processing technology which is based on standard, if excellent, chipsets purchased from third-party manufacturers. Playback Designs MPS-5 has adopted a radically different approach, the use of general gate arrays that can be programmed with their own discrete and proprietary algorithms. This has the added benefit of allowing software based updates. 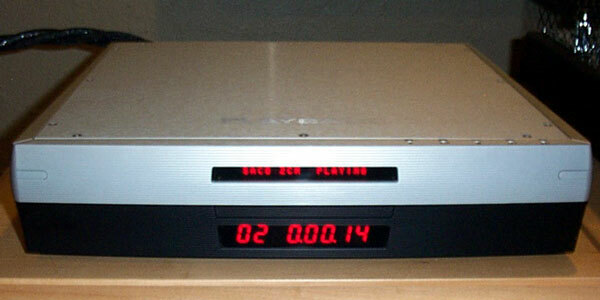 Playback Designs MPS-5 converts all digital audio to a format that has twice the data rate of SACD before converting it to analog. In addition, the company employs novel technology to eliminate jitter which was developed by Andreas Koch, chief designer and a veteran of the digital audio industry having worked extensively for Studer and more recently, EMM Labs. With respect to the ergonomic of the design, many will find the combination of silver and black very attractive. My personal preference would have been one or the other. The red display is rather garish; however, for those of us who are the wrong side of 60, the display is easy to read from the listening position which was most welcome. In addition, it is simple to switch the display off from the remote. The remote has nice heft and weight without being cumbersome. The use of lighted buttons makes use in the dark simple as does the logical lay out of the keypad. My only quibble is that the remote must be pointed directly at the unit to function. The real question is, of course, the sound. The MPS-5 spent equal time in two very different systems, one based around the superb Avalon Isis speakers and Edge Signature 1.1 Special Edition solid-state electronics and the other, a combination of Acapella Triolon Excalibur speakers and Audionote Kegon Balanced monoblock amps. Normally I would not make a point of emphasizing the use of more than one review system but in this case, it bears heavily on the results as I will explain. In both systems, the primary software used for listening comparisons was as follows:Diabolus in Musica, Salvatore Accardo, violin, London Philharmonic Orchestra, Charles Dutoit, Deutsche Grammophion 449 858-2G CD; FIM Ultradisc FIM K2 HD078; and Stravinsky,Le Sacre du Printmps; Bamberger Symphoniker/Jonathan Nott, Tudor 7145 SACD. Various other software was also used. If you do not own the Accardo and Stravinsky recordings, I recommend that you make an effort to hear them as they both approach what I believe are the upper limits of what can be achieved in the digital medium. On theDiabolus, Accardo’s violin sounded very natural via the Playback Designs. It was nicely placed in the front of the orchestra. The orchestra displayed a very homogenous sound with good space and air between the instruments and excellent width and depth of stage. Dynamic contrasts were quite good from pianissimo to fortissimo. Accardo’s performance of this, a technically difficult piece of music by Paganini, was outstanding. On 16th note runs of the violin, it was possible to differentiate each note. The FIM recording is essentially a sampler with a wide variety of different types of music. On the first selection, an excerpt from Rachmaninoff’s Symphonic Dances, dynamics and depth were good, air around and space between instruments was very good. On the next cut which highlights classical guitar, there was excellent delineation between the strings being plucked and good impact of the Flamenco dancer’s heels striking the wooden floor. The sound of the dancer never overpowered the guitar. On another cut, “Left Alone”, the string bass was deep and well controlled. The piano had good impact and a very natural tonality. Vocals were also well served. Vocal decay was nice and the intelligibility of words, quite good – classical music fared well. Stage width and depth was very natural, perhaps a touch wider than the Esoteric. Castanets and similar percussion instruments are well captured. Decay of cymbals was very good and it was easy to discern the type of mallet used on the xylophone, marimba and concerts bells. The MPS-5 has a particularly lovely and extended characteristic at the top end of the musical spectrum. In reproducing the bell tree, some competing designs tend to completely miss the upper register notes. Stravinsky’s La Sacre du Printemps is a particularly demanding piece, both to play and to accurately reproduce in a home environment. On the Playback Designs, the English horn in the introduction is very rich tonally and quite close to the sound of the real instrument. Oboe and bass clarinet were both very natural with good detail. Again, the stage received high marks with good depth and separation between the individual instruments. The unit displayed good extension at both frequency extremes and nice impact. Leading edges were well defined and notes had a very realistic tail. All in all, the Playback Designs MPS-5 helped create a very realistic illusion of the orchestra. Roger Water’sAmused to Deathis a particularly tough test for any digital player. On this CD, I couldn’t get the Playback Designs to image beyond the speakers using either “Normal Phase” or the “Inverted Phase” features of the unit. When playing the same CD through the Esoteric set-up, the imaging was holographic. The ambience would appear to be coming from everywhere in the room. When the CD first starts, the barking dog sounds like it is coming from the neighbors back yard. For the same part of this CD when played on the Playback Design, the barking dog was behind the right speaker. I have extensively compared the Playback Designs MPS-5 with the Esoteric X01-D2 and the P-03/D-03/G-0s (complete system MSRP $49,500). How one responds to either unit is to a certain extent a function of the remainder of your system. The Esoteric gear is absolutely tops in extension at the frequency extremes, particularly the bass where they have superior extension and control. The Playback Designs is less controlled and has more bloom at the bottom. Some will find this more natural, and the Playback Designs can also sound a bit soft at the extreme top. Not lacking in detail but missing the extreme highs although this may be a lack of distortion/jitter artifacts. Likewise, the Esoteric units have better dynamics and superior ability to retrieve detail. The Playback Designs MPS-5 can at times sound a bit confused particularly from the midbass through the lower mids, but at the same time has a natural warmth and harmonic richness in the midrange and upper bass which can at times make the Esoteric sound a bit clinical. In some ways the Playback Designs MPS-5 is like a very good SET amp, sacrificing the frequency extremes for the midrange, the Esoteric, like a very good transistor unit. In a system which is already warm and tube- like, the Playback Designs MPS-5 can be a little too much. In a transistor system, it can be a superb match. In terms of how the units compare and which one you should buy, I would say that it is a toss up between the X01-D2 and the MPS-5. With respect to the P-03/D-03/G-0s, what does an additional $40k over the price of the Playback Design unit buy you? The Esoteric P-03, D-03, G-0s Clock combination is more articulate, has better inner detail, deeper and better controlled bass, a better sound stage with more space. I should perhaps say that the more expensive Esoteric combination also significantly outperforms the X01-D2. As a result of my exposure to the MPS-5, l sold my X01. The question at this point is what will replace it. I would prefer the single-box approach but am considering other options. Great review of the Playback Designs, but unless Nott changed the score, Stravinsky’s Le Sacre du Printemp does not open with a Cor Anglais, but, with a bassoon in its highest tessatura…if you are referring to the first sounds you hear on the SACD!! You are in fact correct that the Rite of Spring does begin with solo bassoonin its highest range. While there is an English horn/ cor anglais solo in the introduction to the Rite of Spring, my memory is that I meant to refer in the review to the bassoon solo with my comment. My memory is that the soloist (and engineer) produced a rich, woody tone that one would wish to hear at that point (recognizing that the bassoon when played that high in therange tends to sound rather un-bassoon-like …and, instead, not un-like its relative the cor anglais. I accept your correction and otherwise appreciate that you enjoyed the review.